If we were told after the first half that Metro would escape Kansas City with a tie, we would be happy. The horror of recent weeks seemed to be amplified; the home team was having its way with Metro. What has happened to our team? Will this bleeding ever stopped? It stopped in the second, as Metro came back and temporarily took the lead, before allowing a late equalizer for a 2:2 draw. A fair result, all things considering, but is it enough to turn around the season's awful start? The 4-4-2 was jettisoned as quickly as it arrived, with the return to good old 4-5-1. Kemar Lawrence missed the game with the flu, as Connor Lade came in. 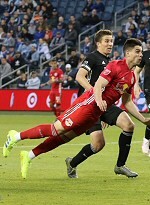 Marc Rzatkowski and Daniel Royer returned to the lineup, as Alex Muyl was nursing his injury, and Mathias Jorgensen was sent down to the reserves. KC dominated from the opening whistle, and were unlucky not to score after a goalmouth scramble early on. They got the goal in the 24th off a throw-in deep in Metro's end. Johnny Russell blew by Lade and beat Luis Robles... and Metro looked dead. They looked a bit better in the second half, and the game changed in the 52nd. A through ball from Cristian Casseres found Royer on the left side deep in midfield; he was kept onside by KC's left back. The Austrian raced down the empty space, rounded keeper Tim Melia and slotted home the equalizer. Then, in the 75th, a perfect ball from Alejandro Romero Gamarra was met by the head of onrushing sub Brian White. Just like that, Metro had the lead. It didn't last, as two minutes from time, Gianluca Busio pounced on a deflected ball off a corner kick. KC almost won it soon after, hitting the crossbar... and that should have been it. Except it wasn't. Deep into injury time, a frustrated Romero Gamarra kicked a ball into the stands, hitting a fan. The two teams got into a fracas, Kaku was ejected, and the referee mercifully blew the final whistle.